I use the above words in class when instructing students to begin their practice sessions. In other words, “wait for the energy to move you, wait to be animated, wait to be inspired.” At the start of a healing session, take a moment to ensure that you’re calmly grounded in body and mind before gently contacting the client’s mind and body. Essentially, you’re waiting to feel the spirit moving through you. It has only recently been realized that when indigenous people speak of spirit in their healing traditions, their definition of the word spirit is the same as our scientific explanation for energy. 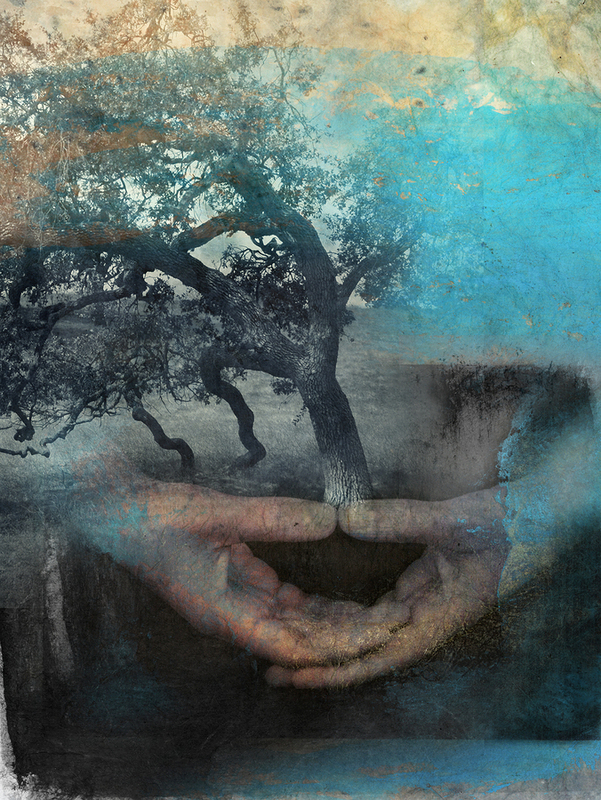 Perhaps when a Druid Priest, Shaman or Medicine Man prayed to or called forth the spirit in an old oak tree this was not an appeal to a ghost living in the woods but reverence from an heart-felt understanding of scientific principles explaining how much energy, or how much spirit, it takes to become a 250 year-old oak tree. The indigenous healer actively acknowledges the deliberate transformation from tiny acorn to mighty tree and allows this wisdom to move through him, to inspire him, to animate his being. In my healing practice and in the classroom, I use the word spirit synonymously with the following terms: energy, Ki, Qi, Prana, Mana, life force, subtle energy, vital energy, ethereal body and universal energy. Spirit is energy; spirit is everywhere and in everything. The word that you’re most comfortable using depends on your cultural background and on whom you are talking with. I prefer spirit because it expresses an experiential quality about energy that is difficult to put into words; elusive yet graspable and it shouldn’t be neglected when expressing one’s physical experience of the human spirit. An example is when we talk about a person’s fighting spirit, or stamina of spirit. Here, the word spirit conveys the feeling-tone by giving the person’s energy an outwardly emotional experience. To me, when one uses only the word energy it lacks the subjective expression and subsequent transformation of character that is essential in mind-body-spirit healing. The Universe’s energy is Spirit, capable of infinite expansion and contraction. It is a real force that can be intuitively perceived and mentally directed. The best way to strengthen one’s Spirit is to understand and practice the unification of mind and body. the vital principle in humans, animating the body or mediating between body and soul. the soul or heart as the seat of feelings or sentiments, or as promoting to action: a man of broken spirit. spirits, feelings or mood with regard to exaltation or depression: low spirits; good spirits. excellent disposition or attitude in terms of vigor, courage, firmness of intent, etc. ; mettle: That’s the spirit! Chinese Medicine is an example of a traditional yet highly scientific understanding of energy. The ancient Chinese described a life force circulating in the body that protected, nourished, and animated all life. This is the foundation of Chinese Medical Theory: universal, life force energy, Qi, in its various stages of vibration and manifestation. It’s important to mention that their concept was universal and widely accepted. The ancient Greeks called it pneuma; Indians from the far east, prana; Paracelsus called it quintessence; the founder of homeopathy called it vital force; and my favorite is Mr. Mesmer’s magnetism. All of these concepts are referring to the energy that is found in the tiniest particles that create and form everything in the Universe. This is actually the same as the concept that is accepted in quantum physics: the entire Universe is comprised of the same energy in varying stages. If you accept that the word spirit can be used interchangeably with the word energy, in the same way as pneuma and magnetism, then spirit is no longer only the mysterious, such as angels and aura, divine beings and holy light, even human consciousness expressed as attitudes, but also the observable, such as earth, rock, metal and this includes you. You are spirit. Everything that exists is spirit continually transforming itself into and being expressed by varying forms. If you consider the process of life, beginning with conception, then birth, growth and finally death you can see that there are many stages of form, or physical expression of your spirit. Spirit is manifesting as the underlying change in all processes in the Universe. All phenomena are interdependent through Spirit. and harmonized by the immaterial breath. I believe that Chinese Medicine is based on man’s reverence for spirit in all things. Why else conceptualize and then express yin and yang as harmonized by the immaterial breath? The philosophy of two, always separate, yet connected includes the Universe. Well, what if we divided the Universe into yin and yang? Our temporal world of matter (planets, trees, mountains, streams) is the yang Universe, while the spiritual world full of unseen phenomena (particles and waves) is the yin Universe. Physical life and spiritual life are united. This balance is described in not only Lao Tzu’s Tao Teh Ching: ‘the One begets the Two, the Two begets the Three’ but also in quantum physics. In Soul or Spiritual Healing it is important to understand that even though everything can be divided into yin and yang all things are seen as their mutual source (One) and then subsequent transformations. Essentially, all things are witnessed as one source of the Spirit that creates into differing appearances. Perhaps you’re wondering what is the point in my preference for the word spirit over the word energy when speaking of the vital principle of healing? One simple point: the strength and courage to heal and renew oneself is spirit; so, why not choose to be mighty like the oak tree?